« Update on PM Abiy’s Visit to U.S.
ADDIS ABABA, Ethiopia (AP) — Ethiopia has “no option” but to pursue multi-party democracy, the reformist new prime minister said Sunday, again shaking up Africa’s second most populous nation that for decades has been ruled by a single coalition. Prime Minister Abiy Ahmed’s chief of staff announced the remarks on Twitter, saying they were made during a meeting with leaders of more than 50 national and regional parties, including ones from overseas, who demanded reforms in election law. A multiparty democracy would need strong institutions that respect human rights and rule of law, Abiy said, according to chief of staff Fitsum Arega. Just months ago Ethiopia, a nation of more than 100 million people, faced widespread anti-government protests demanding wider freedoms, with the U.N. human rights chief and others expressing concern over hundreds of reported deaths and tens of thousands of people detained. The economy, one of Africa’s fastest-growing, suffered. 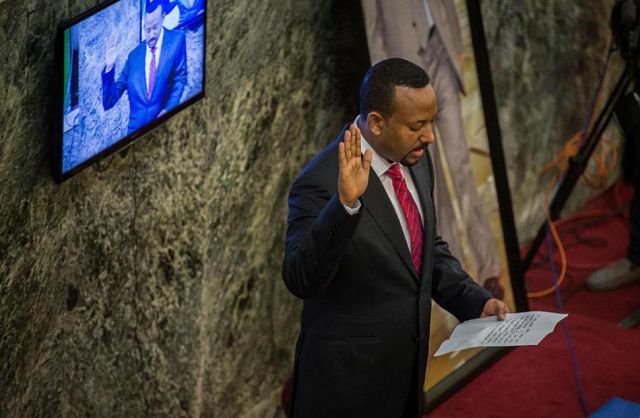 Ethiopia’s ruling coalition, which has been in power since 1991 and along with affiliated parties holds every seat in parliament, came up with Abiy after former Prime Minister Hailemariam Desalegn stepped aside early this year. Notably, Abiy doesn’t come from the Tigrayan People’s Liberation Front, a party in the ruling coalition that has been the dominant force in government for most of the past 27 years. Since taking office the new prime minister has surprised Ethiopians by openly acknowledging past torture by security forces, announcing the opening-up of the state-run economy and suggesting that his own position should have term limits. While the government in the past has called its elections democratic, election observers and human rights groups have reported alleged intimidation and vote-rigging. “Electoral reform, yes. It must be the top priority. Only speedy transition to electoral democracy will save the country,” Jawar Mohammed, a prominent Ethiopian activist based in the U.S., said Sunday on Facebook. While many in Ethiopia have cheered the changes, the dramatic shifts in the country’s long-entrenched government have caused some unrest. A grenade attack last month on a huge rally in the capital, Addis Ababa, shortly after Abiy addressed the crowd killed two people and hurt more than 150. The ruling coalition blamed “desperate anti-peace elements” and vowed to continue with the reforms.